At the release of the Cape White Blend Report yesterday, there was much debate about who actually drinks these wines as they are both esoteric in terms of style and expensive – the average price of the 17 wines to rate 90 points or higher on the 100-point scale was R178 a bottle. South Africa is not a rich country. According to the Organisation for Economic Co-operation and Development, the average household net-adjusted disposable income per capita in South Africa is USD 10 872 (or approximately R150 000) a year, lower than the average of USD 30 563 (or R422 000) approximately a year. Luckily, the market is not monolithic and while there are inevitably plenty of people who won’t ever drink anything more flashy than Du Toitskloof Chenin Blanc, available from warehouse chain Makro for R39 a bottle, there are those with both the necessary wherewithal and level of involvement in the subject of wine to seek out the Van Wyk Olivia Grace 2017, a blend of 56% Chenin blanc, 23% Riesling, 19% Chardonnay and 2% Viognier, which rated 94 points in the Report and is priced at R220 a bottle. That said, scrutinise Winemag.co.za’s regular reports and there are bargains to be had. 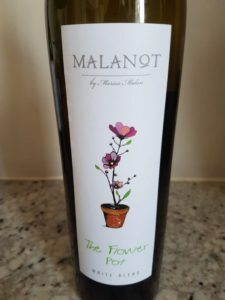 In the Cape White Blend Report currently under discussion, Malanot The Flower Pot White Blend 2014, which rated 91 points, sells for R90 while The Tin Mine 2017 from Zevenwacht in Stellenbosch, which rated 90 points, goes for the same price. The Flower Pot White Blend 2014 from winemaker Marius Malan consists of 36% Chenin Blanc, 36% Grenache Blanc, 14% Roussanne, 10% Verdelho, 2.5% Semillon and 1.5% Viognier. It’s got stone fruit, wet wool and hay on the nose while the palate is rich and broad with layers of flavour and a super-dry finish. The Tin Mine 2017 comprises 66% Chenin Blanc, 25% Chardonnay, 5% Viognier and 4% Roussanne. Aromatically, the wine shows citrus and stone fruit plus some leesy complexity while the palate is again dense and full, tangy acidity lending balance.